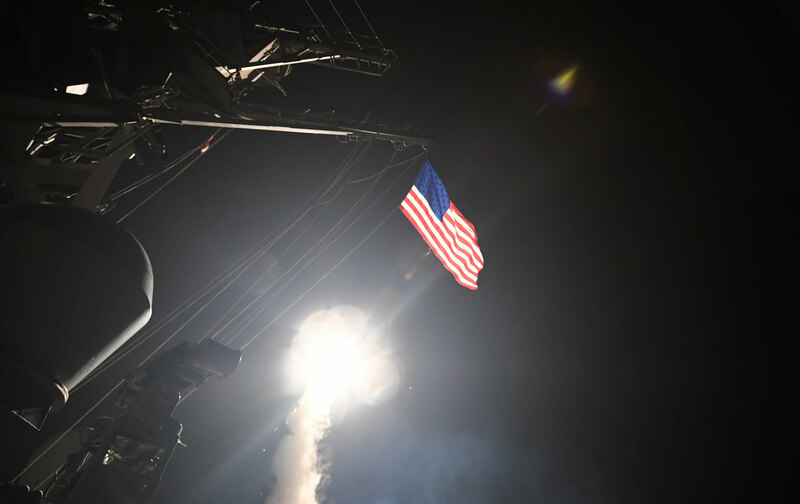 President Donald Trump’s impulsive Tomahawk-missile strikes on the tiny Shayrat Syrian Arab Air Force base in Syria is not the first high-profile use of this weapon by a modern president. A review of past such strikes suggests that they are typically deployed symbolically by presidents in trouble at home, and that they have no significant military implications. President Barack Obama began his air assault on the so-called Islamic State (ISIS, or ISIL) group in eastern Syria in 2014 with 47 Tomahawk missiles. This massive assault, which continued for the subsequent two and a half years with regular bombings by fighter jets, did nothing in and of itself to set back the terrorist organization. In 2016 alone, Obama dropped over 12,000 bombs on Syria. Obama had received substantial criticism after ISIL took over much of eastern Syria and northern and western Iraq for its so-called “caliphate” in spring-summer 2014. Despite US assertions that it has visited substantial attrition on ISIL commanders, these individuals appear to have been easily replaced, and ISIL retains substantial territory in Raqqa and Deir al-Zor provinces. That is, the aerial strikes have had no significant effect, inasmuch as, for the most part, they have not been in support of a ground force capable of taking substantial territory. President George W. Bush began his war on Iraq with a cruise missile “decapitation” strike against Saddam Hussein on March 20, 2003. This strike, which killed innocent civilians in Baghdad, was based on faulty intelligence, and Saddam appeared on television later that day. Human Rights Watch estimated that of 40 aerial strikes on Iraqi leaders, none of them succeeded, but they killed 42 innocent noncombatants and wounded dozens more. President Bill Clinton hit Iraq in June of 1993, early in his first term, in retaliation for an alleged attempt by the Saddam Hussein regime to assassinate former president George H.W. Bush during his visit to Kuwait. Clinton’s approval ratings had plunged to 37 percent that month, and markedly improved after his show of force. His administration alleged that the building hit by the 23 Tomahawks was the very one where the assassination attempt was planned out; six civilians were killed in the attack. That the United States had that level of reliable human intelligence on the secretive Baath regime is unlikely. The missile strikes were greeted in cynical Washington at the time as a Clinton attempt to distract the public from the Lewinsky scandal. That is, they were seen as an attempt to “wag the dog.” The attack on Al Qaeda was ineffectual and did nothing to forestall the September 11, 2001, operation. The bombing of the al-Shifa plant in Khartoum completely destroyed the major domestic maker of medicines in Sudan, which had 300 workers. A night watchman was killed. Later forensic investigations found no evidence of chemical weapons ever having been manufactured there, and US intelligence began backing off its assertions. The checkered record of US intelligence in making charges of poison-gas manufacturing and use should make us cautious about the murky situation in Syria. I find the case for regime use of chemical weapons in Idlib persuasive; unconventional weapons are often used by small militaries facing a daunting foe. Syria’s army, once 300,000-strong, has reportedly shrunk to as few as 50,000. That is not enough to control the entire country, and the regime still faces substantial rebel forces, including the main Al Qaeda affiliate, in places like the northern province of Idlib, where the chemical weapons were used. Still, plausibility is not the same as certainty, and the likelihood that US intelligence on the ground in Syria can make an airtight case here is low. Trump’s strike on the relatively insignificant Shayrat base was conducted in such a way as to ensure that Syrian president Bashar al-Assad almost certainly had time to instruct his some 30-odd Sukhoi Su-22 aircraft to flee. The Syrian Arab Air Force probably has about 300 fixed-wing aircraft left, but not all of them are operational. These planes have been deployed extensively against rebel forces based in civilian urban neighborhoods such as eastern Aleppo, but in the nature of the case, barrel bombs and “dumb” munitions dumped on cities produce high civilian casualties. Indiscriminate bombing of civilian populations is a war crime, of which the Syrian regime is certainly guilty. This aerial bombardment has killed far more children than has the regime’s occasional deployment of sarin gas. Trump’s action, which Secretary of State Rex Tillerson suggested may well be a one-off action, had no appreciable impact on Syrian military capabilities.